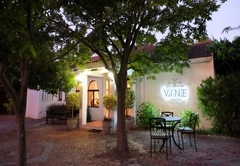 Vine Guest House is a highly recommended Stellenbosch hotel providing accommodation in 12 guest rooms for tourists visiting the Cape Winelands region. 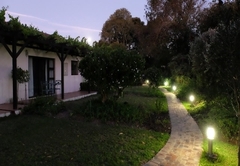 Vine Guest House is a luxury country retreat situated on the famous Bottelary Wine Route of Stellenbosch, between Hartenberg Wine estate and Devon Vale Golf Estate. 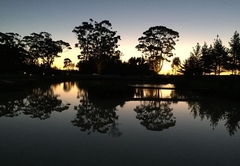 Thanks to our central position, we are the ideal hub to discover the Cape, play golf or enjoy the wonderful wines of the region. 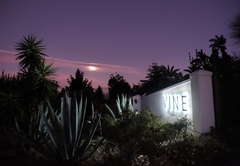 Vine Guest House offers 9 en-suite rooms, all with bath and shower, Mini bar, TV, safe, telephone, hair dryer, aircon, private terrace, comfortably equipped according to European standards, ideal to stay several nights or weeks. 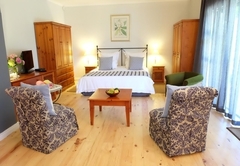 These rooms have a King-size bed or two 3/4 beds and an en-suite bathroom with a bath and a shower. This room has an outside terrace. 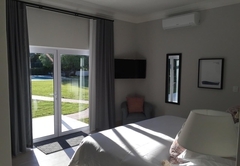 These rooms have a King-size bed or two 3/4 beds and an en-suite bathroom with a bath and a shower. This room has a private terrace along swimming pool or with private garden. These rooms have a King-size canopy bed on the first floor. Downstairs there is a sitting area and a TV as well as a private terrace along the swimming pool. The an en-suite bathroom has a Jacuzzi bath and a shower. 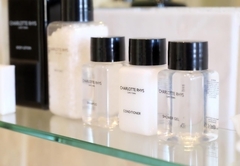 These rooms have a King-size bed and an en-suite bathroom with a bath and a shower. The room has a private terrace and a private garden. 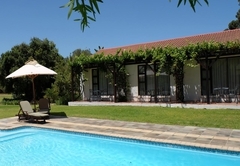 Take a refreshing swim in our swimming pool, play a game of tennis, play a round of golf on the golf course next door, walk through our magnificent garden or through the neighbouring vineyards Hike to the top of the Bottelary Hills and enjoy stunning views over the Stellenbosch area. 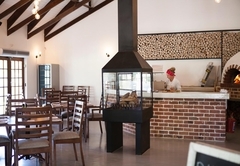 Our restaurant offers a la carte traditional cuisine. 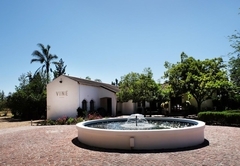 • Visit the famous wine estates next door. 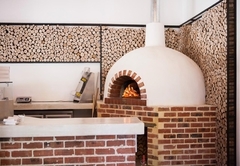 • Visit Stellenbosch Town with a myriad antique and gift shops, restaurants and sidewalk cafes, art galleries and museums. • Play golf on the several international golf courses nearby. • We offer car rental at the best prices. • Airport or city shuttles can be organised. • Laundry or dry-cleaning? No problem, we will organize this with much pleasure. Comfortable bedroom (+-18sqm) with king-size bed or 2 3/4 beds. TV, hairdryer, safe, luggage rack, mini bar, ceiling fan, air-con, coffee machine. Terrace. En-suite bathroom with bath and shower and bathroom amenities. Comfortable spacious bedroom (+-21sqm) with king-size bed or 2 3/4 beds. TV, hairdryer, safe, luggage rack, mini bar, air-conditioning. Private terrace along swimming pool or with private garden. En-suite bathroom with bath and shower. Comfortable double storey bedroom with king-size canopy bed on first floor. Downstairs, sofa, TV, hair dryer, safe, telephone, luggage rack, mini bar, air-conditioning. Private terrace along swimming pool. En-suite bathroom with jacuzzi bath and shower. Comfortable extra spacious bedroom (+-27sqm) with king-size bed. TV, hairdryer, safe, luggage rack, mini bar, air-conditioning, extra wardrobe and a tea table. Private terrace with private garden. En-suite bathroom with bath and shower. We really enjoyed our stay at Vine Lodge - friendly staff and very nice room. 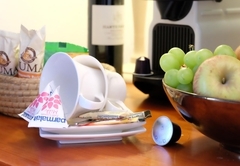 It has a great location with a lovely swimming pool and the breakfasts are delicious. Response timeVine Guest House typically responds to requests in 5-10 minutes.